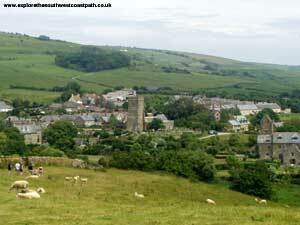 The lovely village of Abbotsbury is the starting point for this walk. 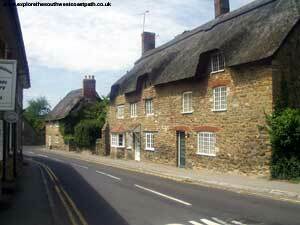 The village is beautiful and unspoilt, with many thatched cottages and two churches. 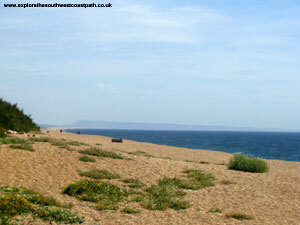 The path initially descends from the village down to Chesil Beach, then follows a lightly-used road along the back of Chesil Beach. There are plenty of opportunities to walk down to the sea, but it's hard going over all the pebbles. 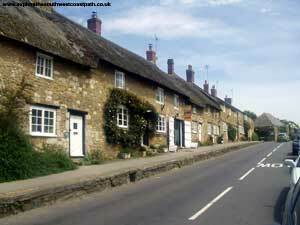 This small road continues to West Bexington where the alternative in-land route joins the coastal path. 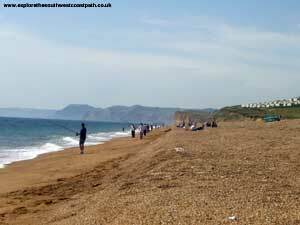 After West Bexington the path continues for a while behind Chesil Beach and a little distance in land through a nature reserve before beginning to climb as you approach Burton Beach, which is a superb beach backed with stunning sand-stone cliffs. 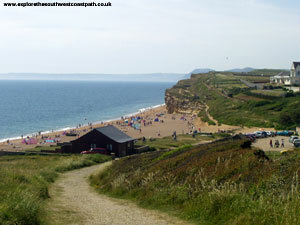 After Burton Beach the path climbs again before descending down to the attractive beach at Burton Freshwater where the path goes briefly in-land around a large caravan site before the final climb to the top of the cliffs where the path then descends into West Bay, near Bridport. 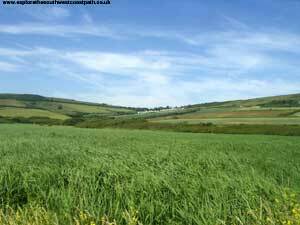 Abbotsbury is on the B3157 which runs between Bridport and Weymouth, and is quite a scenic road. 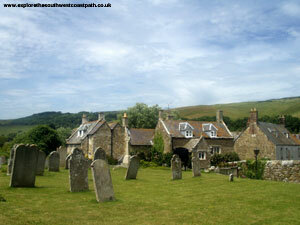 There is a car park in Abbotsbury. 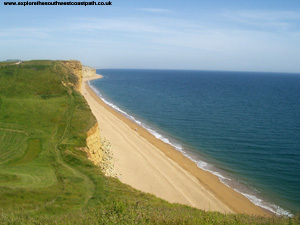 If you're traveling by public transport the Jurassic Coast Link bus that runs between Poole and Exeter via Weymouth serves Abbotsbury. 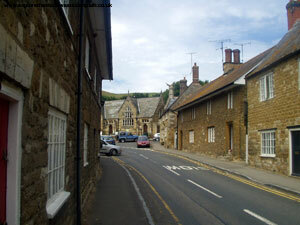 Both Abbotsbury and West Bay are fairly small places and so accommodation is limited, although there is more choice in West Bay than in Abbotsbury. 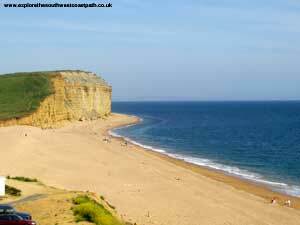 The nearby towns of Weymouth, Dorchester and Bridport offer a wider range of accommodation. 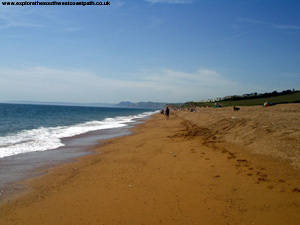 There are tourist information centres at Bridport, Weymouth and Dorchester, which have accommodation lists for the area. 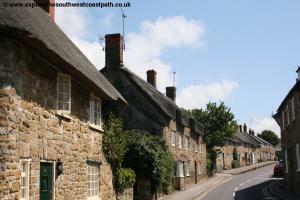 It's worth taking some time to look round Abbotsbury first, as it's a really pretty village. 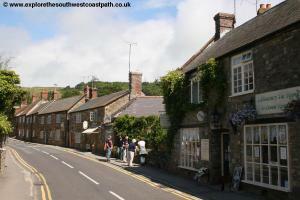 The coast path begins from next to the post office, down a path towards a small farm. There are then two options for the coast path from here, one goes round the front and west side of St Catherine's Chapel before descending to the coast, the other goes round the east side - both join up to the same place. However, if you can spare the time, the climb to the chapel is worth it for the views. The Chapel itself is an attractive building on the outside, but it actually rather plain and empty (there are no seats) on the inside. 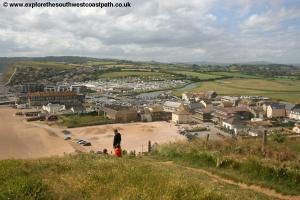 As the path descends you can see Chesil Beach below. The Fleet ends just to the east of Abbotsbury, but the shingle is still quite high, so you can't see the sea once down the hill. 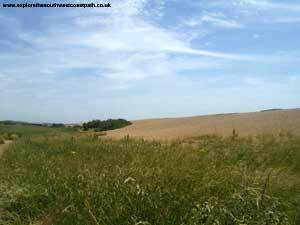 The path passes some Strip Lynchets on the way down and there is a sign about them at St Catherine's Chapel. 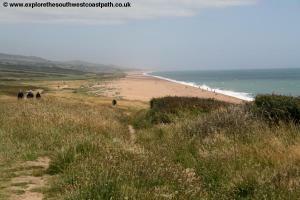 The path is initially shingle for a short distance until you join the small road, where there is also a public toilet. The coast path continues along this road for quite a long way. 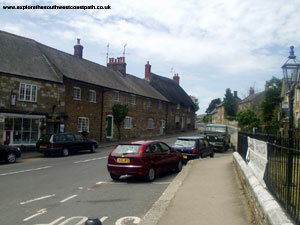 The road is marked as a dead end at the row of cottages and also labeled as unsuitable for motor vehicles, but nevertheless continues and is still used by cars. There are several passing places, marked with Highways Act signs, so I presume it is a legal road, despite not being shown as a road on maps. It is very lightly used however, I only saw two cars using the road when I walked this part of the path. 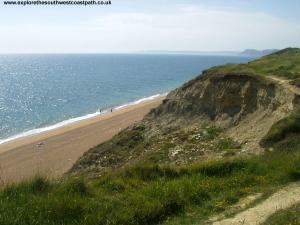 If you leave the path and go onto the beach, there are good views back to Weymouth and Portland in the East and towards Burton Bradstock, West Bay and Golden Cap to the west. 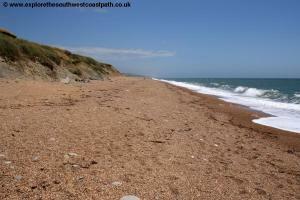 The beach itself is shingle, but it is fairly fine shingle at the shoreline. The partly tarmacked path continues all the way into West Bexington, where the alternative inland coast path re-joins the coast. 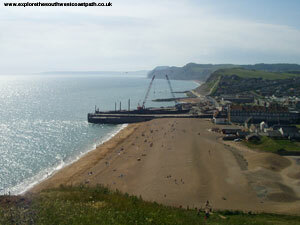 There is a large car park on the sea front here as well as several places to get refreshment and a toilet. From West Bexington, the path is really a path, and is no longer tarmacked. As you head west, you do get some sand at the front of the beach, making it a good place to stop for a break and it's well used by fishermen. 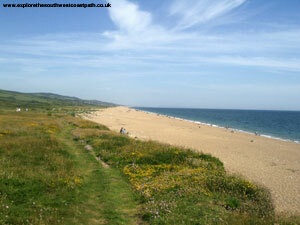 The path passes through the edge of West Bexington Nature Reserve, and there are also some paths inland through the nature reserve. 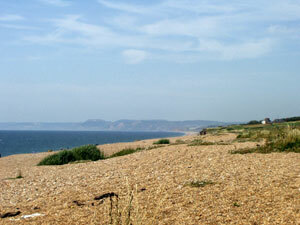 The height of the Chesil Bank means the views out to sea are limited for a while. Shortly after you enter the National Trust land, the path heads a little bit inland to go round Burton Mere although it is possible (if hard work) to continue along the shingle beach if you prefer. Shortly after Burton Mere you rejoin the coast and the path then starts to climb over the low cliffs that begin here, towards a large Caravan Park. The path goes along the edge of the Caravan Park, where there have been a few minor land slips. 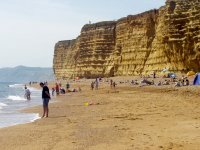 Soon you get a view of Burton Bradstock beach below you, a stunning beach, with the spectacular stepped sand-stone cliffs behind - it's a really a beautiful beach. 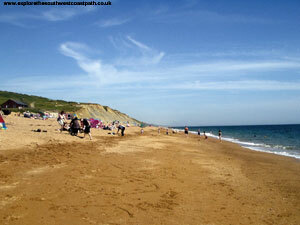 The beach is a mixture of shingle and sand, but is sandy as you get closer to the sea. 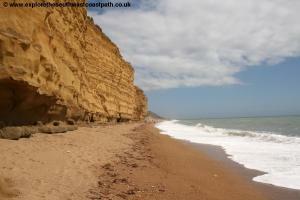 The beach was proving popular in the warm sunshine when I walked this part of the path. There are toilets and a cafe at the beach. 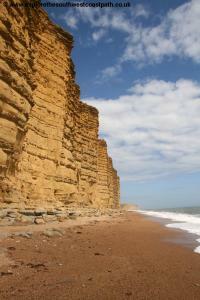 The stunning cliffs are best experienced from the beach, which you can walk along instead of using the coast path, if you prefer. 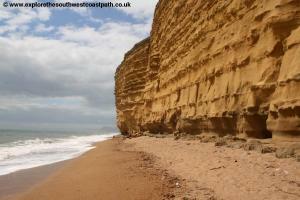 There is a moderate climb away from Burton Bradstock beach, from where you get good views of the village in-land and also towards West Bay and Golden Cap. The path descends down to Burton Freshwater, a beautiful and peaceful beach, although the large caravan park behind it is fairly ugly. The River Bride flows into the sea here, so you need to walk a little inland to a bridge to cross it and you then walk round the edge of the caravan site back to the coast and beach. 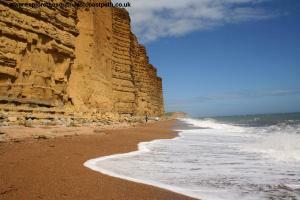 It's another good sand and shingle beach, which you can follow into West Bay. 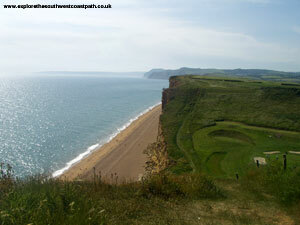 The coast path however climbs the cliff, passing a golf course on the right, where the path descends briefly before climbing back up again. 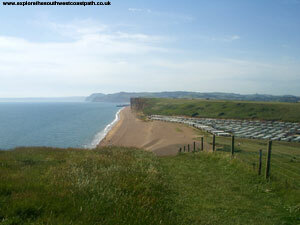 From the top of the second cliff you get excellent views of West Bay and Bridport below. 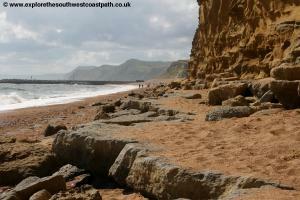 The path descends sharply into West Bay, where there is another good beach and the stunning cliffs. 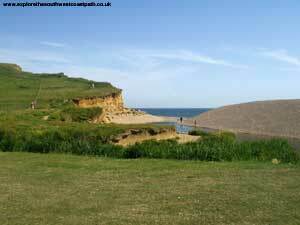 There are good facilities at West Bay, including a pub and toilets (at the old station). 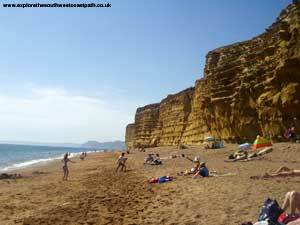 From West Bay it is a short walk into Bridport (there are also buses). Alternatively, there are buses back to Abbotsbury and onto Weymouth, all of the buses departing from the stop outside the George Hotel. 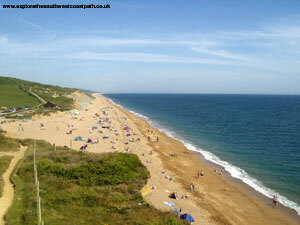 There is a bus approximately every two hours from West Bay to Abbotsbury, which continues onto Weymouth and Poole also, in the other direction, to Bridport, Charmouth, Lyme Regis, Seaton, Beer and onto Exeter. 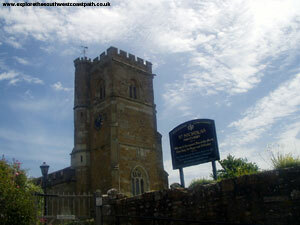 From nearby Bridport there are also buses to Axminster railway station. Ordnance Survey Landranger maps 193 and 194 cover this area of the coast path and they are available from most book shops nationwide. 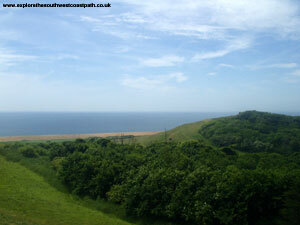 The maps were also available from the post office in Abbotsbury when I walked this section of the path. 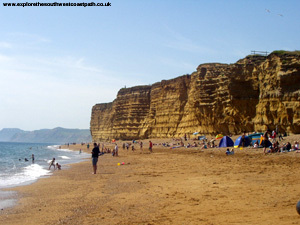 Streetmap is a web site which provides maps of the UK, including around around Abbotsbury, Burton Bradstock, West Bay and Bridport. 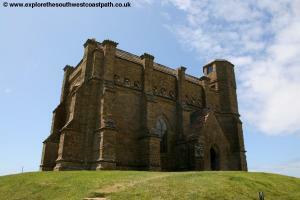 The links below will be of most use to the coast path from Abbotsbury to West Bay and the maps join to provide the complete coast path between these two points.